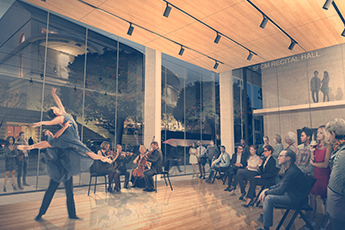 A rendering of the Ute and William K. Bowes, Jr. Center for Performing Arts at 200 Van Ness Avenue. Courtesy of Mark Cavagnero Associates. 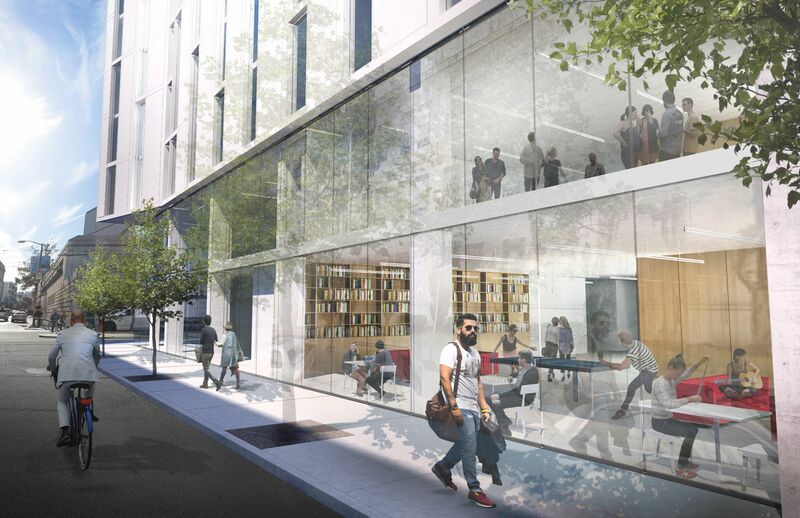 The San Francisco Conservatory of Music announces the expansion of its campus and the construction of the Ute and William K. Bowes, Jr. Center for Performing Arts (The Bowes Center) in San Francisco’s Civic Center. 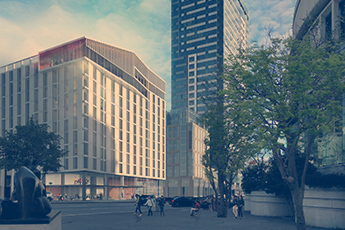 The $185 million performing arts center and residential tower will be located at 200 Van Ness Avenue and began construction in the summer of 2018. The opening of the new building is slated for the fall of 2020 when it will welcome its first class of residents to a facility that will transform students through the study of music at the highest level. The name of the building is in honor and recognition of a financial gift of $46.4 million from the William K. Bowes, Jr. Foundation, which is the largest single gift ever made to a conservatory or music school for a new facility. 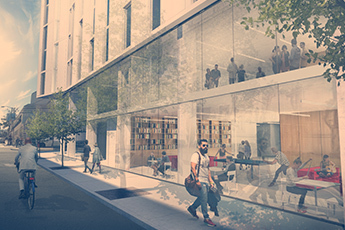 The existing SFCM building at 50 Oak Street will remain in active use through the construction of the new building and after it is completed. 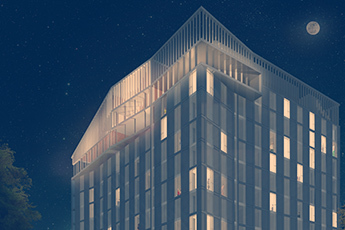 The new, 12-story building, designed by Mark Cavagnero Associates, will provide housing for 420 students and accommodate two concert halls (featuring hundreds of performances annually with over 90% of them free and open to the public), a restaurant with a live performance space, multiple classrooms and rehearsal spaces for ensembles, practice rooms, a recording studio and technology hall, a large observation deck and garden, conference facilities, a student center, and several apartments for visiting artists and faculty. In addition, the new building will include 27 apartments to replace the rent-stabilized residential units previously on site. 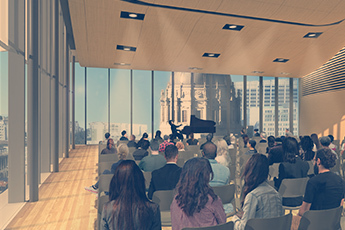 On October 25, 2018, the San Francisco Conservatory of Music (SFCM) broke ground on the Ute and William K. Bowes, Jr. Center for Performing Arts, a new residence hall and performance facility that will house 420 students and offer the community at large hundreds of concerts, many of them free and open to the public. The event was attended by San Francisco Mayor London Breed, SFCM President David Stull, SFCM Board Chair Timothy Foo, Ute Bowes, Eileen Blum, Carol Casey, Bernard and Barbro Osher, and Gordon Getty, among other SFCM trustees, students, faculty, staff, and friends. 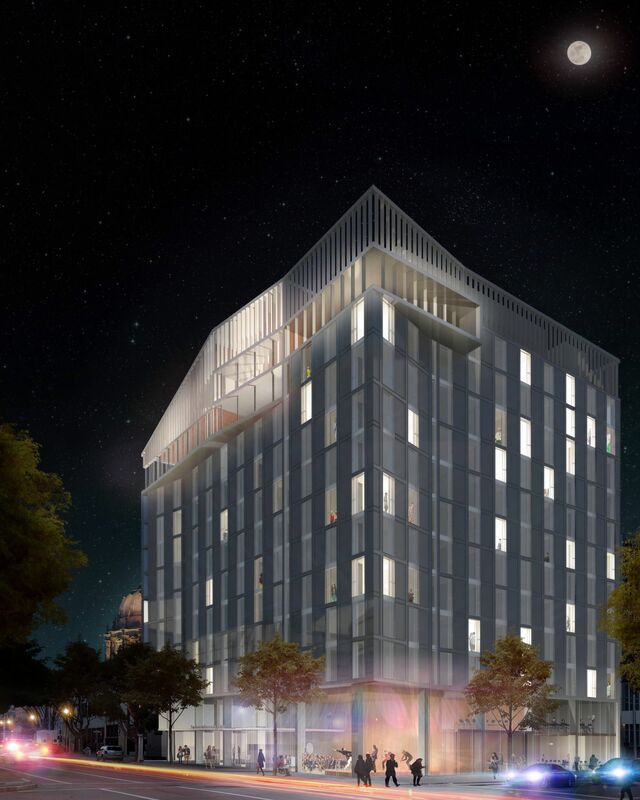 The Bowes Center will feature student housing units that can accommodate 420 individuals. The suites, which are laid out in two- and three-bedroom configurations, are located on nine of the twelve above-ground floors of the building. Each suite contains a full bathroom, kitchenette, and living area, and is designed to accommodate small ensemble rehearsals and individual practice. The twelfth floor includes several guest suites that will provide housing for visiting faculty, guest artists, and others hosted by the Conservatory. Featuring two spectacular concert halls designed to the highest acoustical standards by Kirkegaard and Associates, the Bowes Center promises to offer more performance opportunities and options for SFCM students as well as community organizations. 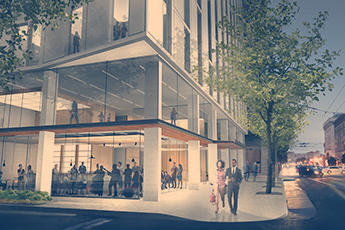 In close proximity to the Conservatory’s 50 Oak Street location, which is three blocks away, the new building will allow hundreds of additional performances to take place. The Jewel Box Recital Hall on the lobby level will seat just over 100 and feature sprung floors that will meet the needs of dancers and performances that require high elasticity on the stage. An accessible, public-facing space that can be configured for multiple options, the Jewel Box Recital Hall features floor-to-ceiling glass walls that extend to the second floor with views of Van Ness Avenue and Hayes Street. The Penthouse Recital Hall on the eleventh floor will seat more than 200 people. 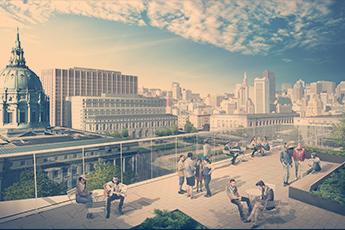 Floor-to-ceiling glass walls will extend up through the twelfth floor, offering views of Van Ness Avenue and the Civic Center at large, including a spectacular vista of City Hall, Davies Symphony Hall, the War Memorial Opera House, and other landmark buildings. Outside the Penthouse Recital Hall will be a large reception area. The Center for New Media on the second floor will comprise studio space, lesson rooms, and listening booths available to SFCM’s Technology and Applied Composition (TAC) and Roots, Jazz, and American Music (RJAM) students. TAC was designed in partnership with leading artists working in the corporate sector of Silicon Valley, and RJAM in conjunction with SFJAZZ, now the largest presenter within its genre in the United States. The models for these programs are expansive: TAC offers curricular direction that includes video game and film music, experimental music, sound design, and production (a skill set that has become increasingly necessary in today’s diverse market), while RJAM provides a holistic view of jazz, delving into an early history of the art form—as far back as its roots in Africa—and connecting it to a contemporary musical zeitgeist. Occupying the space between the lower two levels, the Technology Hall will offer a multipurpose performance and workshop space for multimedia projects and productions developed primarily by SFCM’s TAC program. The adjacent Recording Room will include state-of-the-art recording equipment that directly interfaces with all of the Bowes Center’s performance spaces. The Ute and William K. Bowes, Jr. Center for Performing Arts at 200 Van Ness Avenue (view from the north). The Penthouse Recital Hall, named for the Oshers, on the eleventh floor of the Bowes Center. The Jewel Box Recital Hall on the lobby level of the Ute and William K. Bowes, Jr. Center for Performing Arts. The northwest corner of the Bowes Center with a view of the Live Music Innovation Center on the lobby level. The Terrace on the twelfth floor of the Bowes Center overlooking San Francisco's Civic Center. The Ute and William K. Bowes, Jr. Center for Performing Arts at 200 Van Ness Avenue (view from the south). The Student Life Center on the lobby level of the Ute and William K. Bowes, Jr. Center for Performing Arts. The lobby level will also house the Live Music Innovation Center, consisting of a restaurant and bar with a performance space suitable for small ensembles and lectures. The Live Music Innovation Center will regularly see guest chefs working with SFCM’s artistic team providing complementary dining and concert experiences that combine food, drinks, and music. The ground-level space, complete with floor-to-ceiling glass walls, will feature views of Van Ness Avenue and Davies Symphony Hall. Additionally, the lobby level will include a large student lounge with a self-service coffee bar and other amenities. The top (twelfth) floor of the Bowes Center will feature an open, green Terrace that runs along Dr. Tom Waddell Place—the north side of the building—overlooking the Civic Center Plaza. The Terrace, directly facing the dome of City Hall, will be accessible to students and will offer a beautiful space for dinners and receptions. The Board Conference Room will also serve as a reading room. In purchasing property at 200-214 Van Ness Avenue, SFCM has agreed to replace the 27 apartments currently inhabited by residents at 200 Van Ness Avenue. The third and fourth floors of the Bowes Center will consist of replacement housing at a rent-stabilized rate for the residents who have elected to remain at the location. They will be relocated to a neighboring high-rise building during construction and will be moved into the Bowes Center with the terms of their existing rental agreements. 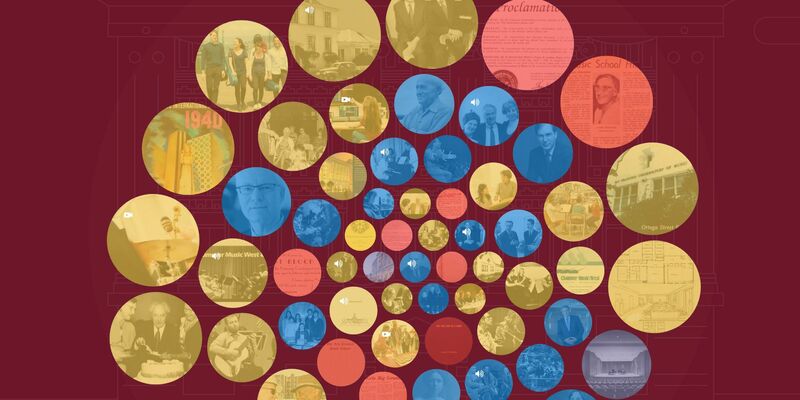 Explore a century of achievement through photos, artifacts, oral histories, and videos that provide the context for SFCM's expansion, setting the stage for the opening of the Bowes Center.